The party of Trump has a corruption problem. Will voters care at all? 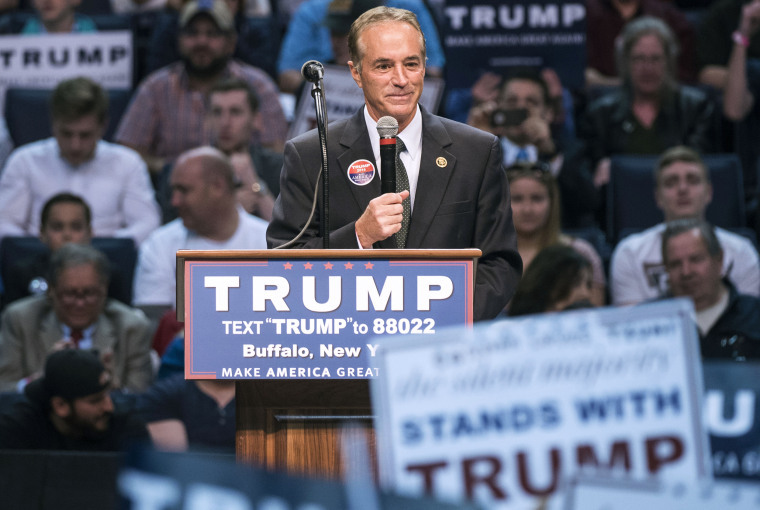 WASHINGTON — Yesterday’s indictment of Trump ally Rep. Chris Collins on insider trading charges was yet another gut punch for Republicans after some bad news inside the numbers from Tuesday night’s primaries. And that hasn’t been the only potential ethical issue for a sitting member of Congress that’s given the GOP headaches this week. A special prosecutor is now probing allegations of forged signatures and ballot shenanigans by Republican Rep. Scott Taylor’s campaign in Virginia’s contested 2nd congressional district — which isn’t exactly the kind of headline you want in a district that’s viewed as very competitive in November. Of course, those are hardly the first candidates this cycle tarred with questions about unscrupulous dealings. Republican Rep. Duncan Hunter also remains under federal criminal investigation into his use of campaign funds. On the Democratic side, Bob Menendez is having a bumpier ride to reelection than expected after being dogged by lingering questions about his dropped corruption trial. E.P.A. administrator Scott Pruitt was forced to resign after a parade of ethical controversies made him the subject of more than a dozen federal inquiries. Forbes reported that Commerce Secretary Wilbur Ross is accused of siphoning more than $120 million from various business associates. ProPublica broke the story that three Mar-a-Lago members (who have never served in government or the military) have been steering VA policy from afar. The Washington Post reported that Donald Trump’s hotel in New York City received a huge increase in revenue after members of the Saudi crown prince’s entourage booked rooms there. The Kushner family unloaded its troubled Manhattan tower to a company that is also waiting for administration approval of another major business acquisition. Trump lost his second bid to dismiss the ongoing emoluments clause lawsuit alleging self-dealing at his Washington D.C. hotel. And of course, the ongoing trial of former Trump campaign manager Paul Manafort has included allegations that he and/or aide Rick Gates falsified financial records, embezzled money, and possibly siphoned money from Trump’s inaugural committee. Perhaps the brazenness of all of this (the head of Marvel? Seriously?) might eventually make the issue of corruption salient to voters. Maybe Trump will remain immune to it, but his invulnerability won’t extend to “regular” politicians like Collins. Or maybe the notion of Washington corruption is so baked in for voters that very little of it will actually matter in November. If Nunes was a generic member of Congress, this kind of statement could be taken for plain old political pabulum for the fundraising masses. But he’s the chairman of the House Intelligence Committee, a position that’s ostensibly above politics and that’s charged with handling the most delicate issues surrounding the Russia investigation. (Contrast Nunes with his GOP Senate counterpart, Richard Burr, for example.) This recording re-raises a question that’s long been out there: Why is Nunes still in the intelligence committee post at all? So, Nelson — who’s facing a very tough reelection race against Gov. Rick Scott, says, without providing evidence, that Russians are already meddling in his state’s elections? The burden of proof is on Nelson here to explain. That’s a very serious claim to make this close to an election, particularly one when he’s on the ballot himself. How much money was spent in those special elections? When we last checked in after AZ-8, Republican party and major outside groups were outspending their Democratic counterparts $37 million to 11.5 million on this cycle’s special election races. That was before the expensive race in OH-12 further drained the coffers of outside groups trying to get their candidates elected. Here’s the update: It’s now about $41.7 million for major GOP outside groups to $12.3 million for the Democrats. We counted independent expenditures and coordinated campaign expenditures (and compared them with Advertising Analytics data) from the Republican National Committee, the NRCC, the NRSC and the two major super PACs affiliated with the House and Senate GOP (the Congressional Leadership Fund and the Senate Leadership Fund). In total, Republicans spent at least $41.7 million on the special elections in AL-SEN, GA-6, MT-AL, SC-5, KS-4, PA-18, AZ-8 and OH-12. With the same metrics for the Democratic National Committee, the DCCC, the DSCC and the House Majority PAC (along with Highway 31) — Democratic groups spent about $12.3 million on the same races. That’s more than a 3-1 ratio. And it shows just how much Republican outside groups were propping up their candidates in these specials, and how untenable that model will be for November. That’s all you need to know about the state of his race versus Beto O’Rourke, in a state where Cruz barely broke a sweat in the 2012 general election and where Trump won by nearly 10 points. By the way, Manigault-Newman will appear in an exclusive interview on NBC’s ‘Meet the Press’ on Sunday.